HCA is dedicated to the development of Canada’s northern communities with a goal to engage community stakeholders in developing and working toward a shared vision for their future. Working directly with key members of the community, HCA adopts a collaborative approach in our evaluation planning, design, and implementation. 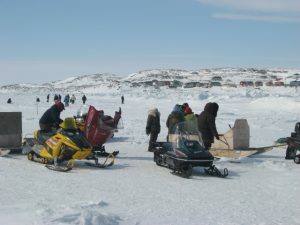 In our northern projects HCA has worked with both Canadian aboriginal and non-aboriginal communities and associations. Applying the lessons learned in urban centres to rural and small communities, we develop creative approaches to identifying new opportunities for northern areas. Yukon Research Centre Evaluation Plan. Design and Development of a Northwestern Ontario/Ontario Food Purchasing Model for the City of Thunder Bay. Cadet Program & Crime Prevention Program for Kativik Regional Police Force. Program Evaluation Sustainable Martial Arts Recreational Training (SMART) Program in Nunavik, Québec. Program Evaluation of CIRQINIQ youth program in Nunavik, Québec. Yukon Labour Market Framework Evaluation Plan. North Bay and Parry Sound District Health Unit, Healthy Communities Environmental Scan. Kwanlin Dun First Nation, Community Health Services Monitoring and Evaluation Plan, Whitehorse, Yukon.